This is where we sell Open Adventure branded items - all of which are available at our events. However, if you don't make it and fancy a map board you can get one here. Starting out in Mountain Bike navigation or perhaps you fancy tarting up that ragged piece of plastic on the front of your bike. 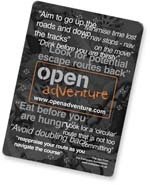 Open Adventure have put together a little map board package to get you off on your bike navigating. You can purchase the boards at Open5 events or online for £10 which includes postage and packaging. The gear review crew at Sleepmonsters have also put a test report on their website so if you want a difference perspective check it out here. Payment will take you via our online entry system - so if you are already registered just login and it will take you to the payment pages. If not - just need to fill in your name, address and phone number, the form will ask you to fill in emergency contact details just fill in your name and phone number again. Any worries please feel free to contact us.